“I will begin with my grandmother on my mother’s side, what I remember my mother telling us as children. My grandmother was a lover of music and she became acquainted with a young man who was very good looking a good singer with curly hair. He was a poor boy and my grandmother’s parents were well to do. It seems that they opposed their marriage for that reason. But they were married anyway. I do not remember his given name (Ulrich Ramp) but my grandmother’s name was Ann Elizabeth Bauman Ramp. They lived very happy although they were poor, and for disobeying her parents she was disinherited which made it very hard for them. In due time, they had a baby boy, and then a baby girl, who was my mother. I do not remember what became of the boy but they made a great deal of the baby girl. The father did work whenever he could. It seems like there always has been hard times for some from the very beginning. “Everything was going as well as might be expected until father died very suddenly, which caused the mother to go to work in some kind of a mill. She was unable to take care of the children and, as is the custom in some countries, she let some well to do people take the little girl and raise her. They sent her to school where she had a good education. Her name was Anna Barbara Ramp. She lived with those people for many years. Her mother would come to see her whenever she could. She was a great lover of all children and when Easter time came she would get eggs and color them as nice as she could just for the pleasure of giving them to children that she knew. She was yet a young woman when she died. “Then my mother, when she was a grown woman, worked in a tred mill which belonged to the people she lived with. They also had children, some her own age. They thought a great deal of each other. “In due time, she met some Mormon missionaries and became very interested in their talks, after which she became a member of the church. During this time she became acquainted with Jacob Rinderknecht, who later became my father, but she didn’t come to America for a number of years after that. “Jacob Rinderknecht had a family when my mother first met him which he brought to America in the early sixties. They lived in New York for a while, then came to Utah. The family consisted of Father, Mother, a daughter and a son (some children having died in Switzerland where they all came from). They settled in Providence on the very spot where my brother Jake Rinderknecht now lives. “All this time my mother was working in her country trying to save enough money to come to America. Finally the time came when she landed in New York. Then she came across the plaints with ox teams and walked much of the way. When she arrived in Salt Lake City, the missionary that she was so good to over in Switzerland was to meet her and take her to Southern Utah. This he never did. “Jacob Rinderknecht happened to be there at the time, having had a chance to go to Salt Lake City with someone that drove an ox team there from Providence. So he got her to go home with him. Later they made a trip to Salt Lake and were married in the Endowment House. 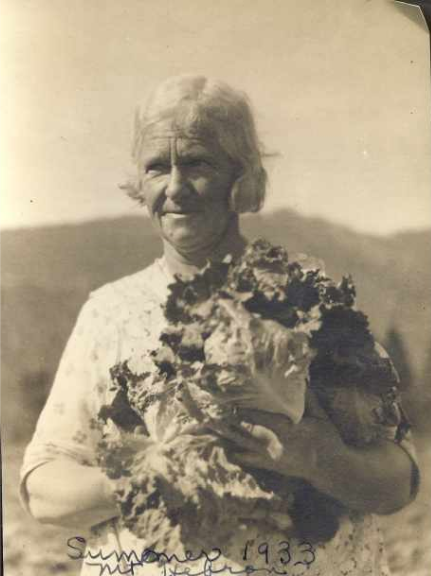 She was then 36 years old and one of Utah’s Pioneers. She was the second wife. I have heard her tell what a terrible, hard life she lived. At that time she lived in a dugout in a bank, or hollow, that used to run through the lot which is now filled in. I think that was where I was born. The first family had a log house and after the first wife died, my mother moved in. “When I was 4 years old my father gave me away. Not long after that he died. I don’t remember him very well. He was 62 and very poor. He may have done this and meant it for my good, but my poor mother fought hard for me. I was older than my brother, Jake, and then a pair of twins; one, my sister, still lives. “My father gave me to some English people of Providence who adopted me. They were well to do for those times. They had buried all their children while babies, and they seemed to take a liking to me. They said I was so pretty, and I guess they were right as I can remember that I had long ringlets, my hair being curly and how hard it was to comb. Once, when I played with the neighbor’s children, I got lice in my hair. My hair had to but cut off close to my head and I was glad because then it was easy to comb. “At first I rather liked my new home but when I wanted to go back to my mother they said no. As I got older I would run away and go home, then they would take me back and I would cry for days. I wanted to go home and my mother did everything she could to get me back, bu no, they watched me so close that I didn’t get a chance very often. I always had the feeling that I would get back sometime. They would lock me in a room and if my mother came to see me they would say I had gone somewhere. Many a time they would see her coming, then they would take me out the back door and hide me somewhere. “As I grew older, they gave me all kinds of hard jobs to do such as going after the cows that had strayed through town and if I didn’t find them or came home without them they would send me to bed without supper in a dark room, or would lock me in a dark cellar for an hour or so. They had so many ways of punishing me that I couldn’t them all. One time, I was trying to jump a ditch of water and fell in backward. I was scared to go home so I sat around in my wet clothes. One of the neighbors told on me, then they took my clothes off, got a gunny sack, cut a whole for my head and some for my arms, then put that on and locked me in a small closet that I couldn’t stand up in, and without any dinner. They left me there all afternoon while they went away. “I had about 4 years of this life which was anything but a happy one. It was the rule those days that the ones that could afford it should go to conference either in April or October. At one of those times, the only man that I can remember calling father, the one who had adopted me, went to Salt Lake. His wife and myself stayed home and did all the work about the place. In due time, he came back and I suppose he was very happy although his wife did a lot of crying and was very unhappy. At the time I didn’t quite grasp the thing or what it was all about but at last it came out. He had married another woman while he was in the city and she was soon to come and live with us. Can you imagine what a trick to play on his first wife? So one fine day she came. She had not been in this country very long. She had come from London and rather a nice lady, a dressmaker, I think and as soon as she found out about me she wanted them to let me go to my mother, but I did not for a long time. “So they finally got things settled and the house was divided and each woman had her half. Then I had more chores to do. And in due time there came a baby son which was the king of the house. When he got old enough I would take him out in his carriage as they called it. One day one of the wheels came off. Then I was scared and ran back to the house to get help. I really was expecting a whipping, but not that time and soon everything was all right again. “One Sunday all the children in the neighborhood were in the street playing. I was inside my fence looking on. I wanted to go out with them so bad that I got up enough courage to go to the house and ask if I could go and play. Then the second wife said, yes, you can go home to your mother if you want to. It surprised me so I couldn’t believe they meant it, so I went out and when I got int he street, which was a straight line and in the third block was my mother’s place, I just ran every bit of the way. “I was, at this time, about nine years old and had started to school. My mother was so glad and yet she was afraid to believe it. I had quite a time trying to make her understand as I couldn’t talk German anymore, but I soon learned. I stayed but I was always on the watch. If any of them had come after me I couldn’t have been found. I was very happy at home again. But one evening here came my adopted mother with an interpreter to talk to mother and try to get me back. She cried and begged me to come. I wouldn’t go near her for fear she wouldn’t let me loose. She promised me things but it did no good. I wanted to stay with my mother, brother and sister. “I was so poor and thin that my mother would cry when she saw my thin little body, but I soon grew big and strong and was large for my age. In due time, I used to go back and see my adopted parents. As I got older I went back and worked for them. They were candy makers and sold candy to the stores in Logan. The book then seems to transfer from the autobiography to the biography of Anna Rinderknecht Nuffer by an unknown person. “In Hedingen, Zurich, Switzerland lived a girl Elizabeth Bauman. She was a jolly happy girl with a good home and many friends. She kept company with Ulrich Ramp, a young man with pretty curly hair. He was a fine singer. These two people were very much in love with each other but Elizabeth’s parents who were well to do disapproved of their marriage and threatened to disinherit her if she married Ulrich, but this made no difference. They were married and lived happily together in spite of being very poor. “A baby girl was born, which they named Barbara. When she was two years old, her father died suddenly. This was a terrible blow to this young mother. Her parents were bitter and did not help her, so she had someone take care of her baby and went out to work. When Barbara became of school age her mother had her put into a home of well to do people who put her through school. Her mother died shortly after and these people cared for her until she was grown. They treated her kindly and she loved them very much, (and later had Temple work done for them). These people owned a threat factory and Barbara worked there along time. She had many friends. She heard of the Mormon Elders and went to their meetings which seemed to impress her greatly. She would walk many miles to go to their meetings and would give the Elders all the money she could spare to get food. She was insulted by her friends when she joined the Mormon Church, but she saved her money to go to Zion. One missionary from Southern Utah fell in love with her and promised to meet her when she arrived in Salt Lake City. “She crossed the ocean in an old Sailing Vessel. There were many bad storms which kept them back. After eight weeks they landed and crossed the plains with ox-teams in the year 1866. Grandmother walked most of the way, she being young and strong. I remember her telling of her breaking her garnet beads, which she prized very highly, on the yoke of the oxen. “After the long walk across the plains with all the hardships of those Pioneer days, scarcity of food, sickness and death, their faith still unfaltering, they finally reach Salt Lake Valley. But in her sorrow the good Mormon Elder sweetheart was not there to meet her as promised. Imagine a young girl here along without relatives. She did get disappointed badly but not discouraged. She worked for other Pioneers for her food. 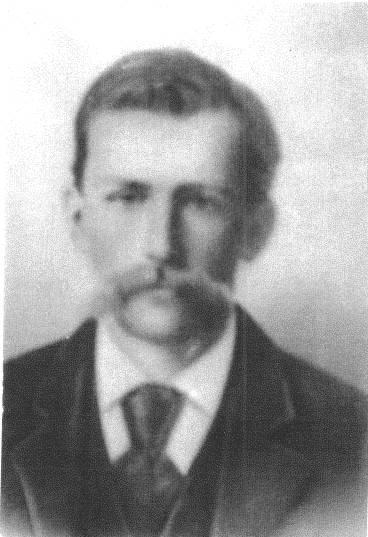 “Jacob Rinderknecht, a pioneer living in the little town of Providence, along with other men, went to Salt Lake City looking for a young wife. He saw Barbara a fine rosy cheeked strong young lady and decided she would be just what he wanted so he persuaded her to go back with him, offering her a home, so she married him in the Endowment House in 1868 and walked back to Providence with him. Here she was introduced to his first wife and family. “Jacob Rinderknecht was in his sixties and Barbara 36. She lived in a dug-out and his first wife was in a log cabin on the old Rinderknecht lot at Providence, Utah. There were four children, one died when very young. When Emma was quite young, her father died, his first wife died several years before. This left the mother to care for the children. She had a garden which supplied her with vegetables, a few hens, and a cow which kept the family. She had a churn which the whole settlement borrowed, and she was noted for her good yeast. She wanted her girls dressed as fine as she could so she hired Sister Campbell to crochet lace for their petticoats and pants, as father (Jacob Rinderknecht Jr.) told me for he would take the eggs to pay for the lace. “She was a real tithe payer, always went to church, although she understood very little English. She taught her children high ideals, love of music, honesty, industry and faith in God. She was fond of her Grandchildren and went to see them at least once a year. “She endured many hardships but she never lost her faith. She said many times she thought God was her only friend. When her children were sick she went for the Elders. “After her husband’s death, Jacob, a small boy, took the responsibility of caring for the family. The girls worked hard. Annie worked for Frank Madison. Emma worked hard, she went to wash for people in Logan so Jacob could buy horses to run a small piece of land. He went up Logan Canyon when 14 years of age all alone and got enough lumber to build the frame house for his mother. I came across some pictures of Paul, Minidoka County, Idaho recently. Thank you to the City of Paul for making them available. I remember this building as a kid. Somehow the alley immediately behind this building I seemed to get puncture weeds that would flatten my tire and then I had to walk over to the tire store to get it fixed. I felt an attachment to the building even though I never entered that I recollect. I was saddened when they tore the building down in the late 1980’s or early 1990’s. The photo says it was the Paul Store Co. on Idaho Street and Main Street in Paul. Just behind the building away further to the right is Paul Elementary. 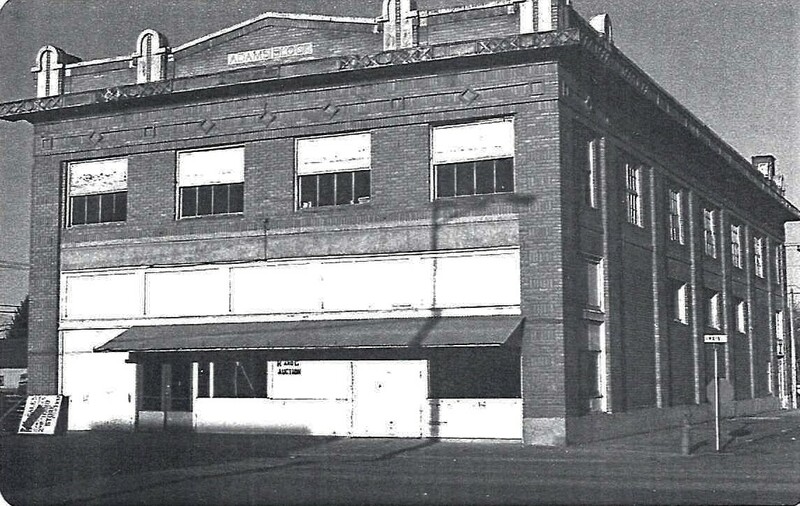 I don’t know anything about Paul Store Co. but this photo has K & C Auction written on the front of the building. I think the Adams Block at the top of the façade is more interesting. J. E. Earley and Frank Adams were the founders of the Southern Idaho Review, a newspaper that was established in Heyburn, not far from Paul. 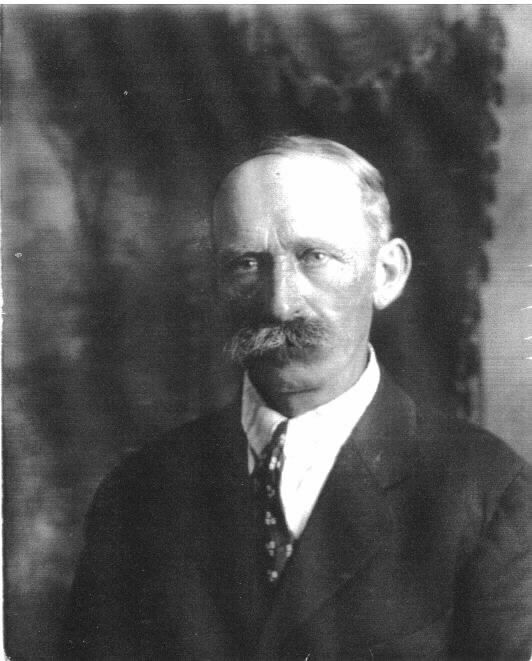 Francis “Frank” Henry Adams was born 18 September 1880 in London, Middlesex, Ontario, Canada. I am not sure exactly why he came to the Minidoka Project, but he was involved with the Heyburn newspaper very early on. The Heyburn website indicates the newspaper started publishing in 1905. Frank then went on to marry Clara Louise Schodde, son of the well-known rancher Henry & Minnie Schodde whose homestead is located about 3.5 miles west of Heyburn, about 2.5 west of Paul and about 3 miles to the south. Clara, born 1 August 1884, is claimed the first baby born in the area north of the Snake in what is now Minidoka County. Frank and Clara married 10 June 1908 in Heyburn by Rev. Merkins. I don’t know what the Adams Building was originally built for. All I know is that it was a stately building that eventually lost usefulness and was demolished for storage units. When I was looking for somewhere to locate my law office when I came to Idaho, I did reminisce about the Adams Building wishing it was still there as I was trying to locate the owner of the old Paul State Bank. The owner was not interested in selling and the Adams Building was only a memory. I remember walking along Main Street when the building was being demolished. I saw the old Adams Block blocks sitting in the rubble and wanting to climb the fence to grab them and take them home. Funny what memories we recall. I was reading a newspaper article this week and it referenced St Pancras Station in London. It made me think about the last time I was there in 2008. Here is an impromptu picture Amanda took on that occasion. 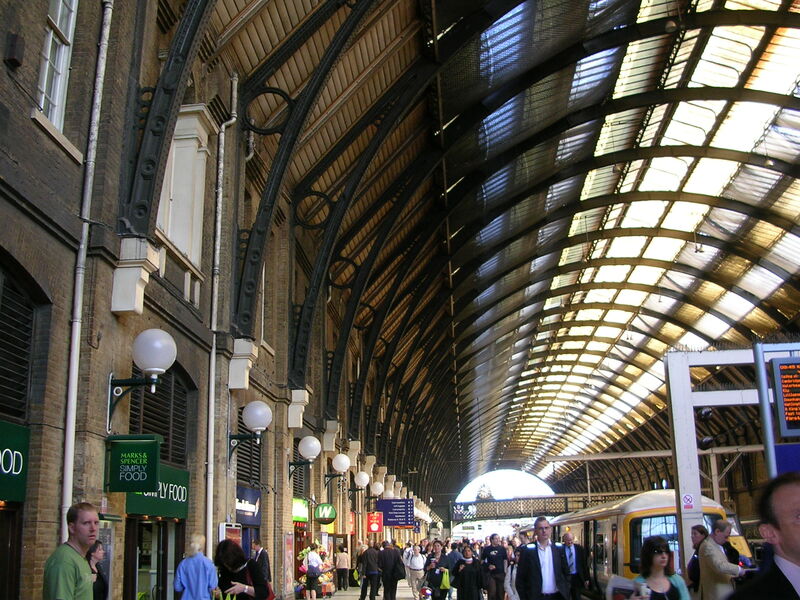 Here you can see a shot of the famed Barlow trainshed. St Pancras Station’s Barlow Trainshed. I believe I had just enjoyed a steak and potato pasty and we were were on our way to find one of the draws of St Pancras besides just catching a train. 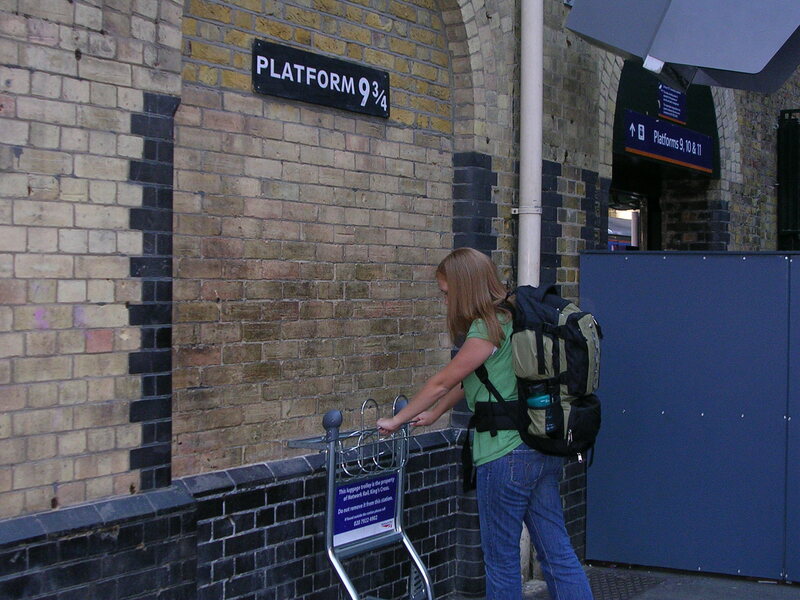 Amanda just had to find this location before we boarded our next train. This was just an extra. We were really there to hop on the Eurostar to go to the Continent. We caught the train and I slept all the way to Lille, France due to a little jet lag. 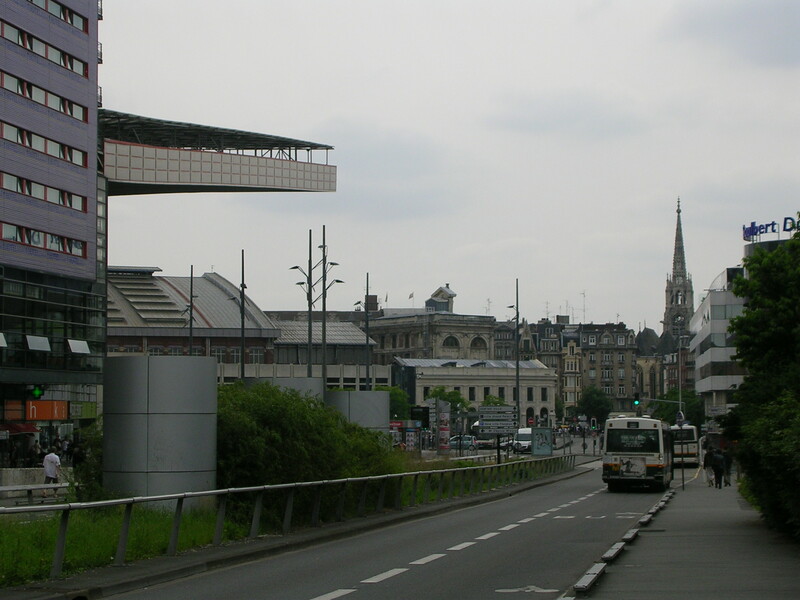 This picture we snapped on the walk between Gare de Lille-Europe to Gare de Lille-Flandres on Av. le Corbusier. I looked it up on Google Maps and boy, the route has changed since this photo was taken. As you can tell, it was a dismal day we were there with plenty of green. Not so much anymore, much more urban now! Av. le Corbusier looking at Gare de Lille-Flandres. We did not take any pictures in Gare de Lille-Flandres, I remember it being quite impressive. Look it up online. Or, I guess we will have to go back. We did take one more picture at Gare de Lille-Flandres. You can see it here and our funny take of it at the time. This morning while everyone sleeps, I thought I would give a quick year in review. Wow, what a year. Probably the best year of my life. I hope I can continue to say that every year! One year ago, it was the first day of being laid off in my life. Good ole Bank of America laid off the entire Wholesale Division. My life as a underwriter came to an end as the mortgage industry was obviously in signs of trouble. I decided to leave the entire industry. Boy, am I glad I did! 1 January 2008 brought a month of trying, scrambling to find out what to do. I had severance for a year and my job working professionally as a genealogist. That carried us through. I have been doing genealogy for the same family over the Christmas Break to supplement our income. That is certainly a great blessing. I know it is a blessing to their family and those who have gone on before as well. I have probably added more than 2 or 3 generations on each of their family lines. The first week or two of January I received an offer for employment in Pasco, Washington covering the states of Idaho, Utah, and Wyoming for Inlande Environmental Resources. I would be making more than 10K more, have my own vehicle, card, and a whole lot more. The only downside is I would be in Idaho most of the time while Amanda would remain in Virginia to finish her education. We decided it was a great offer, much better than our options in Virginia, and could help open doors for the future. The end of January, Brad Hales flew out, and we made a cross country trek in my pickup. Brad has always been a very generous, kind friend. Who would have thought a mission to England would have such long lasting repercussions? February through June found me working for IER working with existing customers and making new sales. The only big contract I found was with J.B. Swift in Hyrum, Utah. It was 2 or 3 truckloads a month at present. They were having so many problems with Thatcher Chemical that it was a fairly easy sell. Honestly, I was just at the right place at the right time. I really don’t think I personally did anything that really made the sale but it made me a favorite with the bosses. We opened quite a few doors. The big thing I enjoyed was the travel. Salem, Portland, The Dalles, Weston, Pendleton, Gresham, and more in Oregon. Toppenish, Yakima, Zillah, Sunnyside, Grandview, Pasco, Kennewick, Wenatchee, and Colfax Washington. Wenatchee was another example of just being in the right place at the right time. We were solving a foaming problem with apple concentrate waste. We just had the right chemical but became known as the defoaming expert! I also traveled all over Utah, Vernal being the most exotic visit. I sure enjoyed Inlande Environmental. They were really good to me and I enjoyed working for them. May rolled around and I decided to accept an opening at Oklahoma City University for Law School. I announced it to my bosses and they were more than accepting. They knew when they interviewed me for the job I was seriously considering law school. They were so good to me! In fact, they let me keep my salary through to August while Amanda and I took our trip to Europe and here to Oklahoma City. Amanda also graduated in May. Amanda’s parents and I flew out for the big occasion. We sure had quite a bit of fun! During the time there we packed everything to move all our stuff to Oklahoma City. We did a little sight-seeing as well. Monticello was probably my favorite place to visit and I was fortunate everyone else wanted to go as well. In the end, I flew back to work in Idaho and Amanda with the in-laws drove to Oklahoma City in a moving truck, and from there to Kaysville in the car. A big first for the year. We purchased our first home! A quaint little 30’s home near 23rd Street NW in Oklahoma City. A wonderful little home with plenty of things to keep me busy but still liveable. June rolled around and then Amanda and I went on our very expensive weight loss program. I can boast losing about 20 pounds running around Europe. We spent six weeks in Europe. Many, many firsts for both of us. We visited friends in Belgium and they were very kind to treat us. Primarily, it was perfect for getting over jet lag! We then went crazy in traveling for the next 6 weeks. About 4 days in Belgium. We attended a Stake Conference in Antwerp and attended dedicatory prayers in Dutch. That prepared us for Brugge, and where we spent our next few days in Amsterdam. We saw the sights and even made a trip to Den Haag. Off we shot across The Netherlands, across Germany to Berlin, and down to an ancestral home in Dresden. I still think Dresden was probably my favorite place. Even better than Vianden or the rest of Luxembourg. Dresden is also near to Meissen which was another ancestral home. I would love to spend a week in Dresden. We shot across Germany through Leipzig down to Augsburg. There we were based to hit Munchen, Dachau, and Fussen for Hohenschwangau and Neuschwanstein. Then we headed off to visit Stuttgart with Neuffen and Holzgerlingen (ancestral towns) before heading to Salzburg. Salzburg was definitely another favorite. Gorgeous town. Then off to sweltering Venice via Innsbruck. There we spent time in a very different culture and climate in a city on the water with no water to drink! After Venice, up through Padua to Zurich and down to Bern. Bern was definitely another favorite. I really wish we could have spent some good quality time there. Then off through Lausanne and Geneva for a few wonderful, long, unorganized days in Paris. If there was ever a point Amanda and I were getting tired it was in Paris. More with each other than with the city. But we really enjoyed Paris nevertheless. If we had been stuck in Amsterdam during this time, we may have been in marital breakdown, but Paris made it bearable. After Paris, we headed back to Belgium for a day or two before flying off to Prestwick, Scotland. We then were in a car for the next 3 weeks! That day we made our way through Glasgow before ending in Edinburgh for some wonderful times there. We really liked that city. I could certainly feel we were back in the United Kingdom. There is a flavor in the air that reeks of Britain. From there we worked our way down through Manchester, Liverpool, Northern Wales, Birmingham, Bath, Dorset, and finally to London. In the UK we spent two weeks of it in the old stomping grounds of the England Manchester Mission. We visited loads of people I knew and tried to balance that with seeing the sites for Amanda. I think we did a good job. We also caught up with some long time friends, the Gores and the Byroms. We also met up with my old missionary companion Elder Gheorghe Simion and his wife who now live in Liverpool. After the mission we visited ancestral homes near Birmingham, even stumbling on a cemetery in Halesowen with plenty of ‘my’ Coley line. It was fun. Bath was quite a bit of fun crashing that night with a cousin in Milton Abbas, a gorgous little Dorset town. They treated us very, very well. Then off to London crashing with the Jeppesen’s in Weybridge. We spent our remaining time with them in their posh house until we flew out. All in all, we loved our entire trip. Paris could have used a bit more planning, but the trip as a whole was utterly marvelous. We feel very, very blessed to have been able to take the trip. We landed in Utah and the gears started grinding in different ways. I tried to make sure everything was a successful transition for IER and we headed out for Oklahoma City. We arrived here the very last week of July. Before August had arrived we had moved all our possessions into the home and started setting up for the next few years. I went to work on the yard, Amanda went to work on the inside. We came to know our ward, get lined up for school, Amanda a dental hygiene license, and job. Everything fell into place within a month. I was rolling with law school and Amanda had a job blocks from home. The rest of the year was fairly uneventful. I sat trying to recoup some of my weight lost in Europe (I have been unsuccessful, not that I really want it back) in the law school library. I picked up squash here again. Amanda works her days away. I am slowly remodeling a bathroom with all that extra time. Amanda took up sewing our Halloween costumes and organizing Thanksgiving and Christmas. Then the year was over! All in all, what a year! I feel highly blessed of heaven. Who could ask for anything more? We have started paying off student loans for Amanda. We are also paying for some work done on the house and what little remains of our trip to Europe. We paid off the washer and dryer, now the refrigerator next. Then we can start socking it away for retirement (since our retirement took quite a hit in October and since!). Plus there will be plenty more to do to the house if we should really want to invest. But all in all, God has been very good to us. May he continue to light our paths and may we continue to do what is needed to bring down the extra blessings! I am looking forward to 2009, although I think it will be much less eventful than 2008. But hey, who knows? Today is officially the last day of our trip to Europe. Can you believe we have passed a full six weeks in Europe?? We visited St. Paul’s, The Tower of London, Tower Bridge, and the Globe Theatre today. They were all cool. However, at this point another cathedral and I will injure myself. Sir Christopher Wren did a great job on the inside, but the outside seems to be lacking some. Perhaps it is years of paint and wear. Perhaps it is war. The interior was amazing. A couple of thoughts to wrap it up. Amanda figured out that in the ‘To Let’ signs around Europe, meaning ‘For Rent’, if you put in an ‘i’ it becomes ‘ToiLet’. We wanted to get up and alter one or two of them, but we did not. Secondly, on my second to last day, I was the target of a pigeon. On the front stairs of St. Martin in the Fields, I sat pondering life when a large drop fell on my right knee. I thought it was some water until I realized it was warm. Looking over, I saw the signs of whiteness indicating a deposit by some bird. It was a laugh, some disappointment, and disgust. Reminded me of the seagulls leaving a deposit in the Roman Baths in Bath. Alas, I am humming along with John Denver about leaving on a jet plane. A brief update of our past two days. Yesterday was Westminister Abbey, Houses of Parliament, Buckingham Palace, Trafalgar Square, Piccadilly Circus, and more. We went to see Wicked at the Victoria Apollo and we both really enjoyed it. Sunday we went to Hampton Court Palace. It was a very fast tour, but we made it through the entire house. The rest of the time was enjoyed with the Jeppesen Family.